son of F. and S. A. Bishop, aged 26 years. healing to do over the next few years. 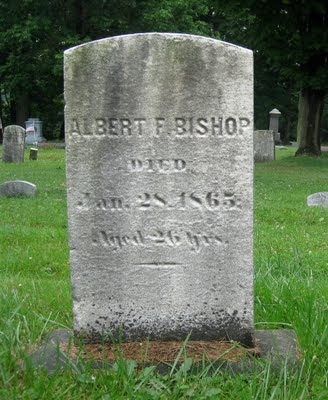 Freedom West Cemetery (Freedom, Portage County, Ohio), Albert F. Bishop marker, lot 91; photographed by Shelley Bishop, 2009. Walter F. Bishop, Aged 20 yrs. 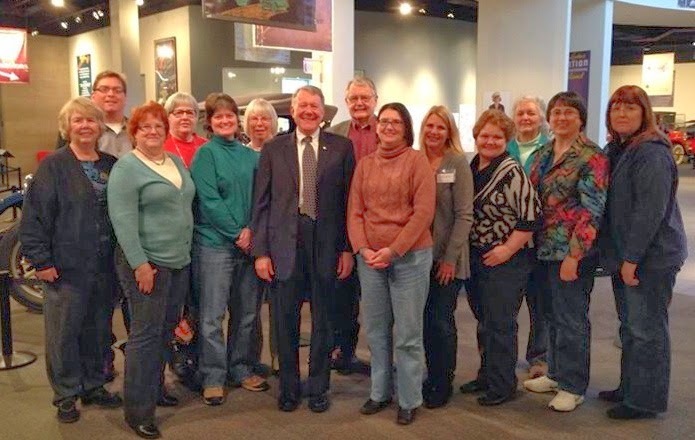 I’m writing this from Utah, where I’m attending the Salt Lake Institute of Genealogy (SLIG) this week. I’m learning a lot from the class that Paula Stuart-Warren, CG, is teaching on “American Records and Research,” and having fun talking genealogy with classmates and friends. But another great thing about being here is the chance to do research at the Family History Library. I’m spending virtually every spare minute there. Yesterday, after cranking many rolls of microfilm, I loaded up #1514064 and made an exciting discovery: my great-great-grandparents’ marriage record. There it was, plain as day, in the record book of St. Peter’s German Evangelical Church in Cincinnati. Yes! Although the family has an oral tradition that John George Herrel and Wilhelmina Mueller were married here in the U.S. after emigrating separately from Germany, no one has seen a marriage document, and the date was unknown. 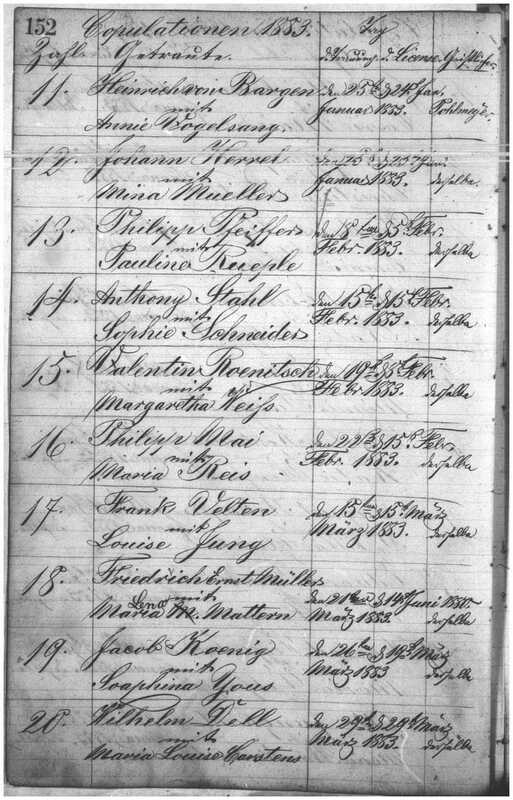 They came too late for the 1880 census, so aren't found until 1900 in Cincinnati. Since the Hamilton County Courthouse was completely destroyed by fire in 1884, a church source like this may be the only surviving record. I think the last column is for the clergyman, but can’t make out his name. Any ideas? 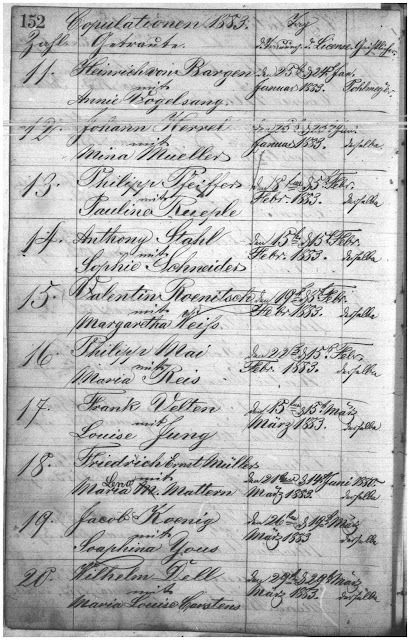 Source: St. Peter’s German Evangelical Church (Cincinnati, Ohio), “Copulationen, Confirmanten, St. Peters Gemeinde, Angefangen 1874,” p. 152, no. 12, Johann Herrel and Mina Mueller (1883); Family History Library microfilm #1514064, citing original records at Wright State University (Dayton, Ohio). Ok, I’ll admit I’m a little uneasy with putting my genealogy goals out here for all to see. What if I fall flat on my face and don’t get any of them accomplished? Public goals are so, well, public. And sometimes, even when I set out with all good intentions, real life interferes and things don’t quite go the way I planned. But I guess I’ll risk it. Besides, even though I’m relatively new to blogging, you all seem to be pretty understanding and supportive. If I run into problems or get stuck along the way, maybe you can help me out. 1. Research my Ballenger ancestors back to at least the early 1800’s, and complete an OGS Settlers & Builders of Ohio application for them. 2. Find the parents of Carrie Beum, who married John Evans and was the mother of Ruth (b. 1898) and Leatha (b. 1900) Evans. Carrie died when Leatha was five months old, and not only were the connections with her family lost, but records of her seem to be hiding as well. 3. 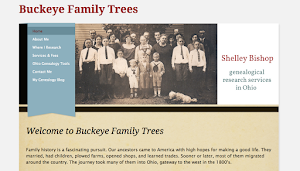 Research the ancestry of my husband’s grandmother, Annah L. Crites. 1. Write research reports for my own files as I complete segments of research on particular questions or individuals. 2. Complete writing assignments for remaining lessons in the NGS Home Study Course and ProGen Study Group. 3. Create a narrative summary or mini-book out of the research I’ve done on the Bishop-Crites family. That last one will be a real challenge. But it deserves to be a top priority, because I’d like to make something I can share with my father-in-law, who is probably my #1 fan when it comes to genealogy. He’s a World War II vet, and as we all know, that generation isn’t getting any younger. So it’s something I’ll have to figure out. Looks like I’ve got my work cut out for me in 2011! Written for the 101st edition Carnival of Genealogy, "Research/Writing Goals for 2011"